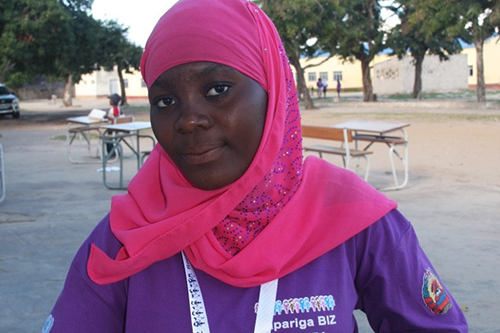 MAPUTO, Mozambique – “We are equal to boys and can also contribute to society,” said 17-year-old Lidia Suale Saide. Lidia knows what it means to stand up for these beliefs. One year ago, she refused her mother’s attempt to marry her off. She said she wanted to become a doctor instead. “I want to become independent and free of the harms and expectations placed on girls in my community,” she told UNFPA recently. 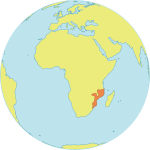 But many girls in Mozambique are not able to avoid marriage. Child marriage is widespread in the country, with 48 per cent of women aged 20-24 reporting they were married before reaching age 18. Child marriage often pushes girls from school, and it leaves them vulnerable to abuse and early pregnancies, which can cause lasting harm or even death. Child marriage and teen pregnancies are closely linked: In Mozambique, some 40 per cent of young women report giving birth before age 18. But Lidia is helping to change these trends. She is now a mentor in Raparinga Biz, a UNFPA-supported programme that has mobilized tens of thousands of adolescent girls to learn about their sexual and reproductive health and human rights, as well as about citizenship and life skills. 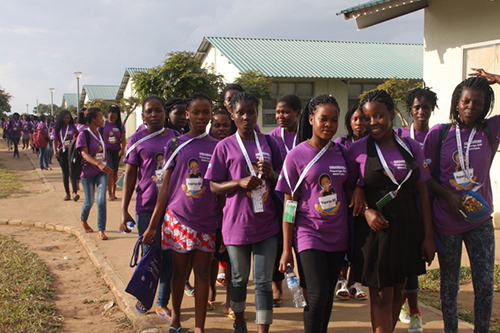 This knowledge is helping girls advocate for themselves and each other: Within the programme’s first year, only 1 per cent of the 23,500 adolescent girls involved were married before turning 18. Raparinga Biz, which translates to “Busy Girl,” was launched in May 2016. It has so far reached 90,000 girls and young women. It directly takes on one of the root causes of child marriage and teen pregnancy: gender inequality. Girls discuss the importance of equality, empowerment and human rights. Too often, gender inequality takes the form of violence against women and girls. Even school can be an unsafe environment. Seven in 10 girls in Mozambique know of cases of sexual harassment and abuse in their schools, a 2013 UN report indicated. Maria is another of the new mentors trained under Rapariga Biz. She spoke about her experience during a mentors’ training session on human rights. She wants to help other girls stand up for themselves and their rights, and to help girls seek justice if abuses do occur. The resilience of mentors like Maria and Lidia is one of the programme’s strengths. Mentors are able to draw from their own experiences, as well as their training, when educating and advising other girls. Lucia*, from Angoche District in Nampula Province, was pressured by her family to become the wife of a man who was already married. As an orphan, Lucia had little support in opposing the marriage. She ultimately married him against her wishes. She was miserable, and after much negotiation with her extended family, she managed to leave the marriage. Today, she focuses on her studies and advocates for change as a Raparinga Biz mentor. Raparinga Biz is led by the Government of Mozambique, with support from UNFPA, UNICEF, UNESCO and UN WOMEN. The programme also receives funding from the Swedish International Development Cooperation Agency and the UNFPA-UNICEF Global Programme to Accelerate Action to End Child Marriage. It aims to reach 1 million girls and young women by 2020.